For students who have practiced yoga for at least one year and are interested in deepening their practice. Emphasis on yoga technique in relative stillness, occasional vinyasa patterns explored. For yoga practitioners, dancers, dancer-wannabes and those who wish the creative expression of yoga paired with music. Strong standing poses technique, healthy backs and knees required. To see examples of topic and teaching style on Facebook, click here. Scroll down to Yogadance play list. 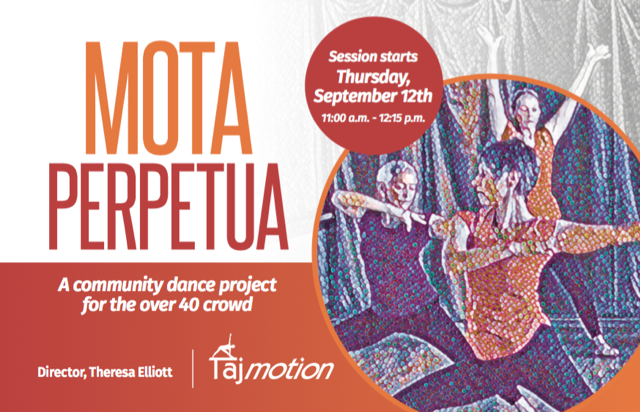 Mota Perpetua is Latin for perpetual motion. This dance class and optional performances are for the dancer and dancer-wanna-be’s who thrive on movement, music and self-expression. Participants learn anatomically sound dance skills and put them into practice through original choreography and famous dance covers. A new sequence is studied each month, giving students 4 – 5 classes developing and learning to “own” the moves. Those who wish to perform can take it to the next level through additional rehearsals that focus on musicality, phrasing and performance techniques. Participation in class is required to perform. Approximately six weeks before a performance rehearsal times will be added, time and day TBD. No charge for rehearsals. Can I drop-in to try out the class? Yes! Keep in mind that a new sequence is studied each month. What if I am not sure about performing, can I still take class? How many pieces will we perform? 1-2 choreographed works per event. Participants will supply their own dance/performance supplies: outfits and possibly knee pads. Nerd out on the poses with those who understand you. Several poses per class will be dissected, discussed and practice after analyzing influencer muscles and bones. Structure of the series is informal, largely based on the interest du jour, and no homework will be assigned. Class requirements: Participants must have an established home practice. Come with your favorite anatomy book and/or Essential Anatomy app. 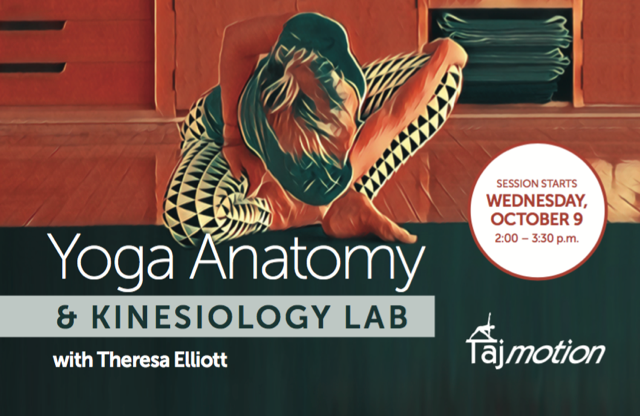 Class is of the workshop-deconstruction style variety and open to all who are curious about how to move in yoga with grace and dignity. 5 years of alignment based technical training is required, preferably in yoga. Ability to do head and shoulder stand is a good thing and of course, sense of humor is a must. Practitioners from all styles of yoga are welcome as principles of alignment and movement will be explored and adapted to all forms. Topic for the day will be determined in class, or by email requests received in a timely fashion, assuming Theresa can and wants to address the topic.